The weekend is coming and you’ve decided to have friends over. You’re figuring out what to cook, what to drink and how you’re going to get the house cleaned in time. 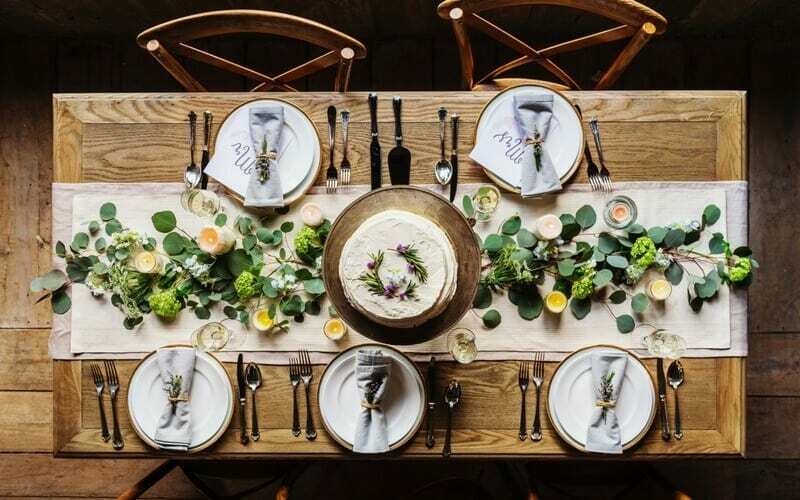 You may not realize this but there are many benefits to entertaining – whether it be throwing a small party, having an impromptu BBQ or inviting your friends over for dinner. As someone who has the odd get-together, I still would like to have more and encourage others to do this on a regular basis. To get everything ready in time, you and your other half are going to have to do this together. You’ll have to work together to enjoy time together. One of you vacuums while the other preps food. One of you runs for last minute ingredients while the other sets the table. It sometimes seems like a lot of work, but it’s always worth it. You see, when friends come over or you’re in a social setting together you get to see your partner as themselves – not a dad, a mom, a spouse, but themselves — the person you fell in love with. You get to see their humour, their kindness and all the little things that you appreciate but sometimes overlook. Do you ever notice after doing something social with your other half that you feel closer and somehow more connected. You see what others see in your spouse. It also means you actually get to do something together other than talk about errands, paying bills, driving the kids to activities and planning kids events… you get to be a couple again. Yes! 2. YOUR HOUSE GETS A PROPER CLEANING! 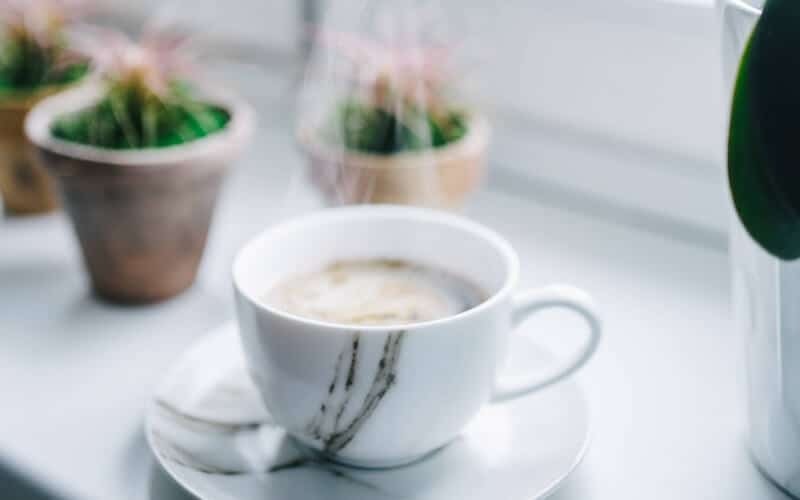 Okay, okay – this obviously is not the only time you give your place a good cleaning, but let’s be real – for those that aren’t Suzie homemakers (like myself) my place is not always perfect and I’m okay with that. So, when I have guests come over it’s a good excuse to get everything back in order where it belongs and give the place a cleaning from top to bottom. The best part is that everything is in decent shape the next day too, so it makes the rest of the weekend that much more peaceful and enjoyable. Make a simple (yet delicious) meal that can be ready to go BEFORE people arrive. I encourage you to have a glass of wine and sit down 10 minutes before. This might be hard but try and do it. Your evening will be that much better. Allow yourself to relax. You are most likely inviting friends over. Your friends love you for YOU, so don’t stress over having everything perfect. Honestly – who cares! As long as you have good people, great conversation and some laughs that is all that matters. Oh and waking up the next day is good for the soul, as a) there is most likely some delicious left overs, b) the house is still relatively tidy (depending on the kind of party you had!) and c) you have some fun stories to laugh about and to share at the next get together. Now, look at your calendar and invite some friends over. Life moves too fast to not enjoy the simple moments and to spend quality time in your relationship. This game is SO much fun and something that everyone would love. We went to a game night at a friends place and played Scattergories. It’s hilarious and extremely competitive! 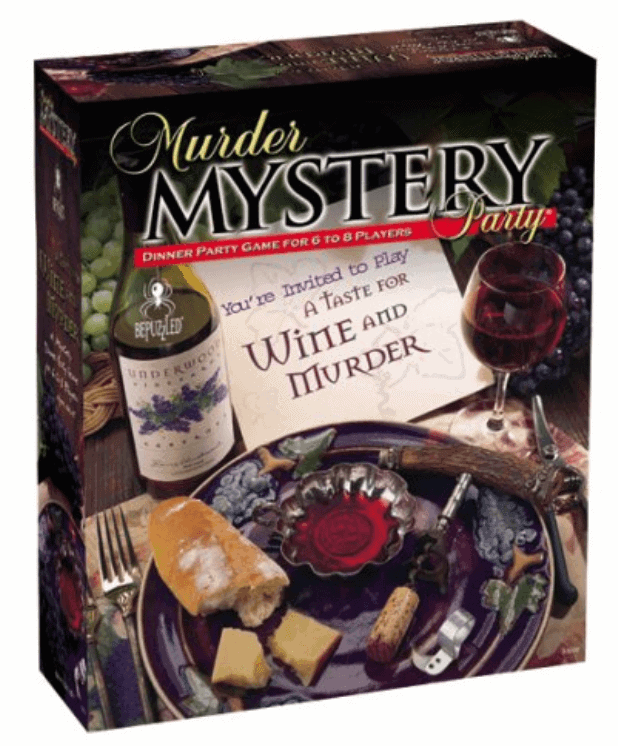 I went to a New Years Eve Murder Mystery Party years ago and I was the chosen ‘murderer’. No one guessed it was me! I haven’t played this exact game (yet), however the reviews are really good (4.5 out of 5 on Amazon). Yes, I said that right. This game sounds a little crazy. I promise you though it’s really good! A friend brought this out at their place one night and we were playing it for hours. YES!!! I have always wanted to entertain more than I do, and every time I have, I have been happy about numbers 1 & 2 on your list. I still haven’t quite mastered number 3, yet… LoL! These are all so so true! I always love entertaining once I get past the initial anxiety and preparation headaches, haha. I’m always so glad to have people over once they’re here! I hear you! Sometimes we can get ourselves worked up and running around too much beforehand but it’s always worth it. Loved reading this! I love entertaining and coming up with creative decor and menus, but I think #2 is my favorite reason. Shhhh…don’t tell my guests! 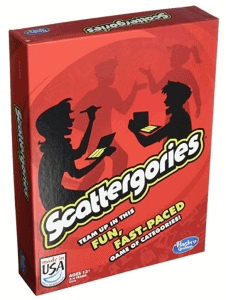 I definitely need to get Scattergories! My hubby and I love to entertain together. It’s such a fun way to spend extra time together preparing for a get-together! Great ideas! And I love your table setting! Yes! 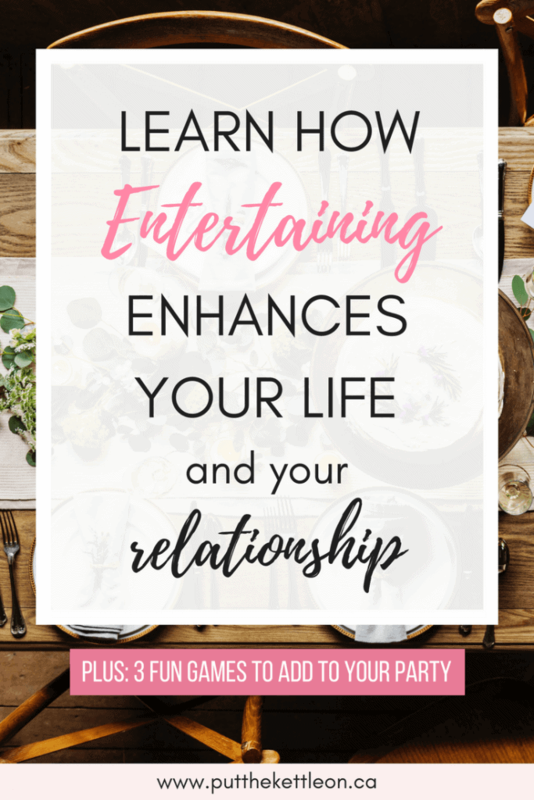 Entertaining does have so many wonderful benefits like you mentioned. My goal is to clean up our backyard and host a dinner back there. i am so looking forward to completing our home renovation so that we can get back to entertaining more. House does get an extra special cleaning when there are people coming over. Just fun and I love to bake and cook so entertaining is fun. I love how entertaining forces you to clean your house. My favorite entertaining meals are potlucks where everyone pitches in, thus, minimizes my meal-planning stress. My husband and I have been trying to get into the habit of entertaining at home but every time we make friends, they PCS (we live on a military base). I want to do more this year! I had to laugh at the part about the house getting a proper cleaning, because it is so true. I need to work on the not stressing part. I LOVE to entertain! We haven’t done it lately, but we plan on going back to it and adding games to it. Maybe a multi-family night since we have kids..
What a great post. We really enjoy entertaining in our home. I believe the key to it all is to keep it simple when you can. It really makes for a great way to maintain and deepen relationships! I especially love that you mentioned that the house gets a cleaning. It is hilarious because we are expecting company in about 30 minutes and we just finished cleaning 15 minutes ago. Haha, number two is definitely my reason to entertain as well. And that is also probably the reason why I don’t do it as much. Oops. We almost never play games, but we should. These look like fun! My hubby and I have an inside joke that if we want the house clean, invite guests over! It works wonders!!! haha! Love this post! The relaxing part is always the best and board games are always lots of fun too! Scattegories is like my all time favorite game ever. I’ve never actually played the other two, but I think that i need to learn and try! Isn’t it the best!! So much fun. 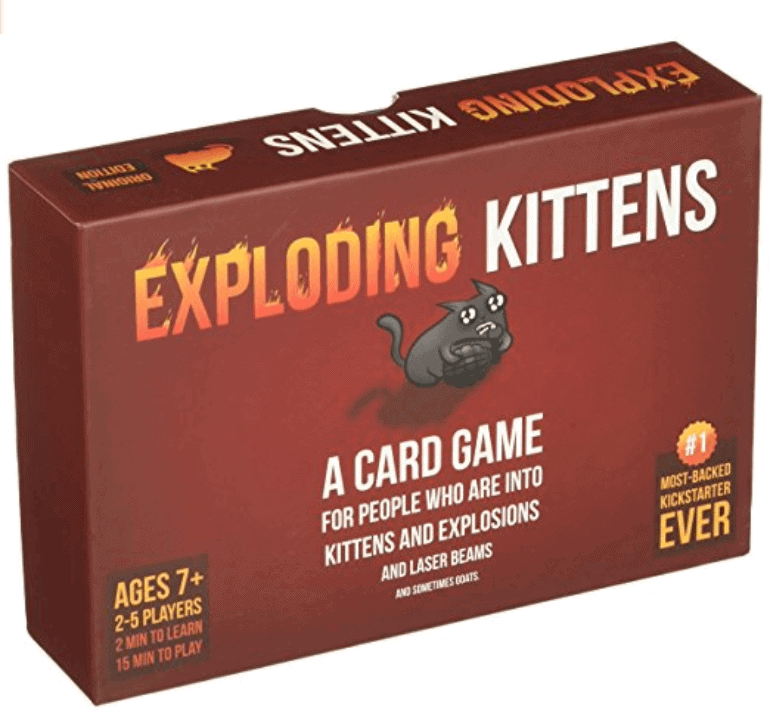 Just recently played Exploding Kittens! It was super fun! <3 My family loves sitting around the table to play games and laugh! You're list is so true!! (Especially the deep cleaning part!) Thank you for sharing! Nice! It’s SO fun 🙂 Thanks for the feedback Katie. We absolutely love entertaining! We try to do it as often as possible! Nice! I think entertaining at home is a way better night than going out. So much more personal and relaxed! Love this post! These are so important and true. I love how when we entertain we feel just as fulfilled as our guest. I can’t wait for the Holiday fun to begin. These games will be the perfect addition to those moments. Thanks so much Tiffany! Yes – lots more entertaining with holidays around the corner!! Yes indeed my house gets a real cleaning when I know I am going to entertain. I love being a hostess, it does bring everyone together! Absolutely! A clean house, friends and food = happiness! !